Confederacy, Confederate States of America, Post Office Department, Official Business, Chief of the Appointment Bureau, office imprint endorsed by "B.N. 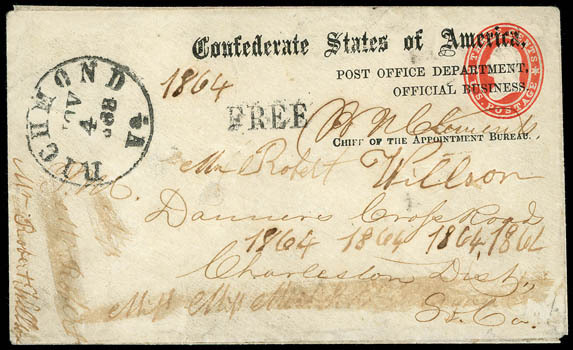 Clements" on U.S. 3¢ star die entire (U26) to Danner's Cross Road in Charleston S.C., cancelled by "Richmond Va. Nov 4 1863" cds with matching "Free" rating handstamp; some docketing erased, Fine. Only Official Post Office Department mail traveled free of charge. No such covers into or out of the main Charleston Post Office during the war are known to date, likely due to the relocation of postal operations several times in 1863-64, when nearly all the records were probably destroyed. Danner's Cross Road was a tiny post office located near Charleston. 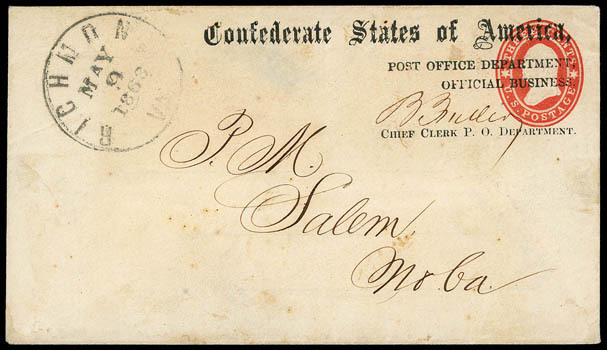 Confederacy, Confederate States of America, Post Office Department, Chief of the Appointment Bureau, imprint on U.S. 3¢ red (U26) star die entire signed by "B.N. Clemens", entered mails with light "Richmond Va., Dec 4" cds and matching "FREE" rating handstamp to the Postmaster at Fredericksburg Va., Very Fine, ex-John R. Hill Jr.
C.S.A. Catalog No. APP-04d; $500 Estimate $300 - 400. Confederacy, Confederate States of America, Post Office Department, Chief of the ntract Bureau, official imprint with "Co" of "Contract" missing, on U.S. 3¢ red (U26) star die entire signed by "H. St. Geo. 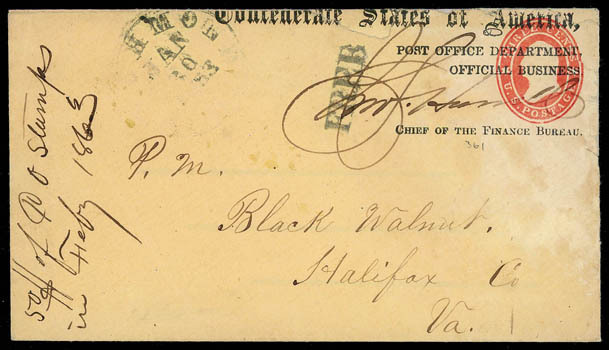 Offut" signature, entered mails with "Richmond Va., Jul 16, 1863" cds to the Postmaster at Fredericksburg Va., Very Fine, ex-Marcus White, John R. Hill Jr.
C.S.A. Catalog No. CON-06c var. ; $600 Estimate $300 - 400. The "Co" of "Contract" missing variety is only recorded on the U.S. 3¢ red Nesbitt issue in the C.S.A. catalog. It is not listed on the 3¢ Star die issue. Confederacy, Post Office Department, Official Business, Chief of the Contract Bureau, printed semi-official imprint signed by "H. St. Geo. 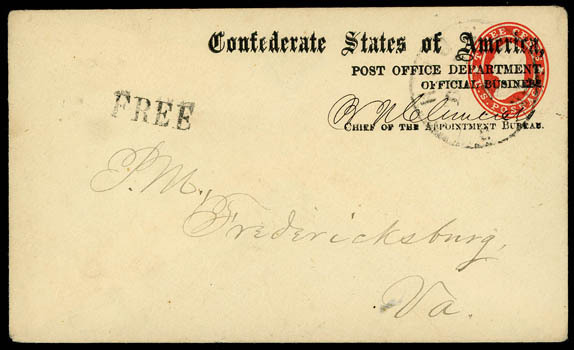 Offutt" on legal-size cover with bold "Richmond Va., Oct 20, 1863" cds and matching "Free" handstamp to Fredericksburg Va., Very Fine, the listing example. C.S.A. Catalog No. CON-01 $450. Confederacy, Confederate States of America, Post Office Department, Chief of the Finance Bureau, imprint on U.S. 3¢ red (U10) buff Nesbitt entire signed by "Jno. L. Harrell", entered mails with "Richmond Va., Oct 9, 1863" cds and matching "FREE" rating handstamp to R. Thom, Postmaster at Fredericksburg Va., 1863 docket at left, Very Fine. C.S.A. Catalog No. FIN-02a; $500 Estimate $300 - 400. Confederacy, Confederate States of America, Post Office Department, Chief of the Finance Bureau overwritten "Clerk P.O.D. 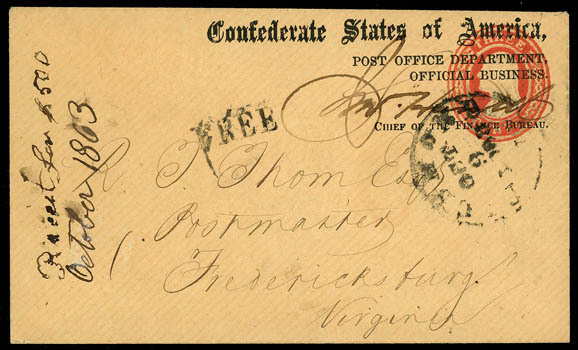 ", imprint on U.S. 3¢ red (U9) Nesbitt entire signed by "B. Fuller", entered mails with "Richmond Va., Aug 19" cds with matching "FREE" rating handstamp to R. Thom the Postmaster at Fredericksburg Va., 1863 docket at left; mended nick at right, Very Fine appearance, ex-Hill. C.S.A. Catalog No. CLK-02 var. Estimate $200 - 300. Confederacy, Post Office Department, Official Business, Chief of the Finance Bureau, official imprint signed "Jno. 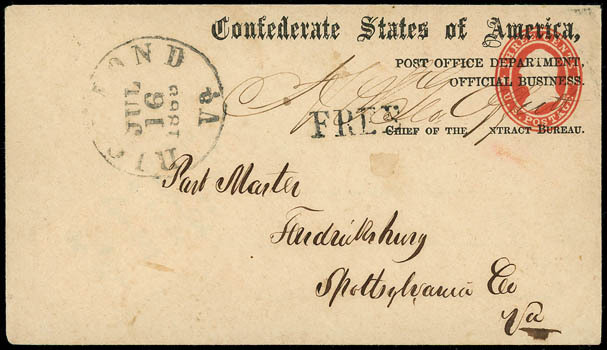 L. Harrell" on U.S. 3¢ red (U26) star die entire to the Postmaster at Black Walnut, Va., partial "Richmond, Va., Jan 30, 1863" cds and matching "Free" rating handstamp, docketed "50$ of P.O. Stamps in Feby 1863" at left; reduced at top, light staining, Fine. C.S.A. Catalog No. FIN-06c; $500 Estimate $150 - 200. Confederacy, Confederate States of America, Post Office Department, Official Business. Chief of the Finance Bureau, imprint cover signed by Chief of the Finance Bureau, Jno. Harrell, to postmaster at Sangerville, Va., with "Richmond, Va., Jan 6, 1863" cds and matching straightline "Free"; small stain at lower right, still Very Fine. C.S.A. Catalog No. FIN-02c; $450 Estimate $200 - 300. 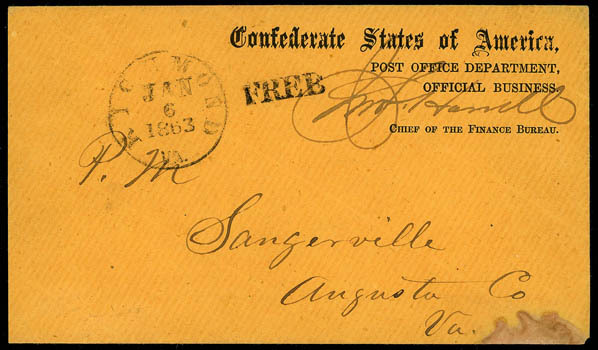 Confederacy, Confederate States of America, Post Office Department, Chief Clerk P.O. 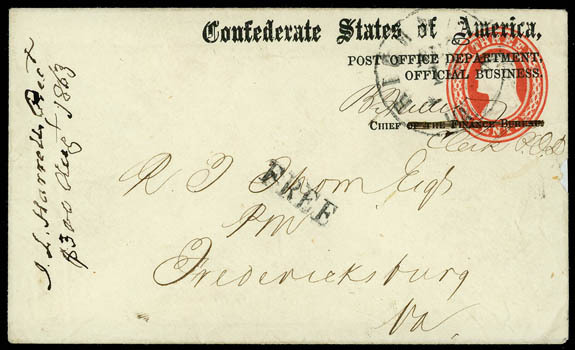 Department, official imprint on U.S. 3¢ red (U26) star die entire signed by "B. Fuller", entered mails with "Richmond Va., May 9, 1863" cds to the Postmaster at Salem N.C.; small part of flap missing, Very Fine and rare imprint, ex-John R. Hill Jr.
C.S.A. Catalog No. CLK-05a; $500 Estimate $300 - 400. This imprint is the same as CLK-03, except the "Chief Clerk" line starts to left of "Post". 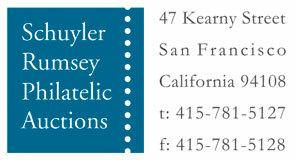 The CSA does not have an image example for this listing type.